an easy recipe of cake made with whole wheat flour, sweetened condensed milk and butter. wheat cake recipe with step by step photos – an easy and delicious recipe of eggless cake made with whole wheat flour (atta), sweetened condensed milk and butter. 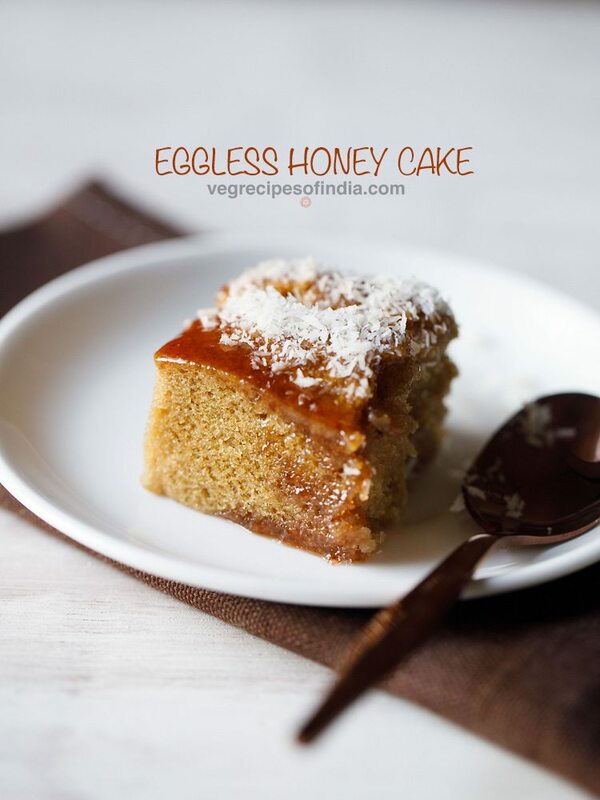 i had got a few requests for an eggless sponge cake made without curd or apple sauce or aquafaba or any puree. so i created my own recipes to get a cake which is light, fluffy and soft like a sponge cake made from eggs. i have had sponge cake made with eggs many times as a kid and in fact even made them many times during my teens. so when developing eggless sponge cake recipes, the texture never came to the ones made with eggs. a few recipes were disasters. again i tried to develop an eggless sponge cake recipe. before preparing the recipe, i was thinking whether to add whole wheat flour or all purpose flour. finally i decided to add whole wheat flour. the recipe was a success. it did not have a sponge cake like texture, but too good for a eggless whole wheat cake. 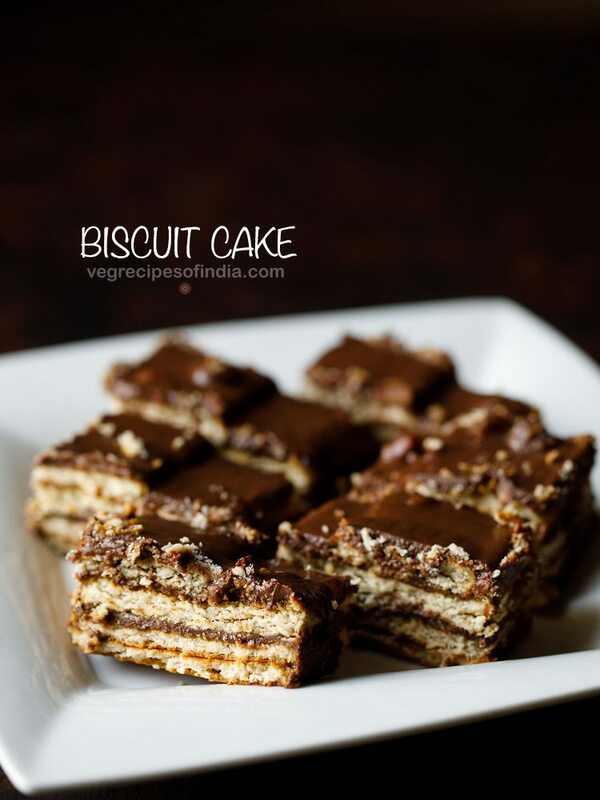 decided to add this recipe as why not share a good recipe with good results with all of you. if i can prepare it, so can you. and it is indeed satisfying and fulfilling to bake cakes and breads for your family. more so when they have an additional health element in them. the recipe makes for a 6×6 inches whole wheat cake and its a small cake. 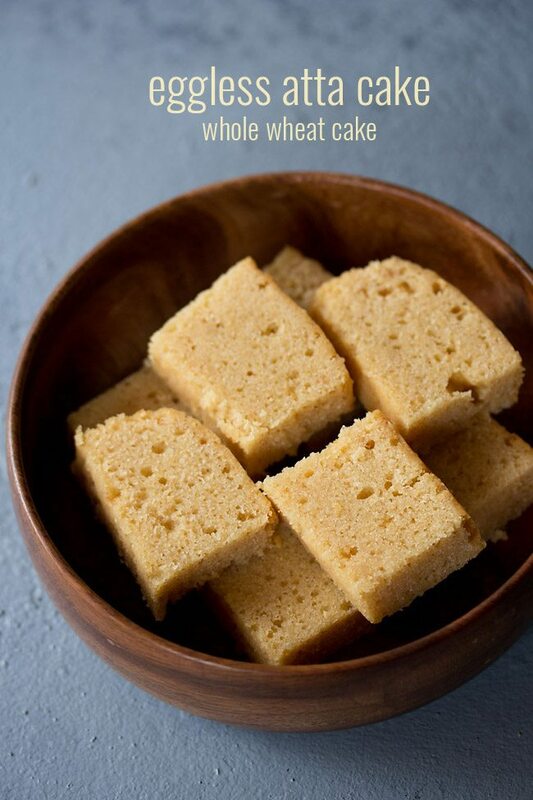 you can serve this wheat cake plain as a tea time snack or even as a dessert. you can also use this cake as base in trifle pudding and even frost it with any icing. i have also used this recipe and made few changes to make sponge cake recipe in pressure cooker and also this egg free carrot cake recipe. please do note that i have used organic chakki ground whole wheat flour in the recipe. its the same flour which i use for making chapatis. 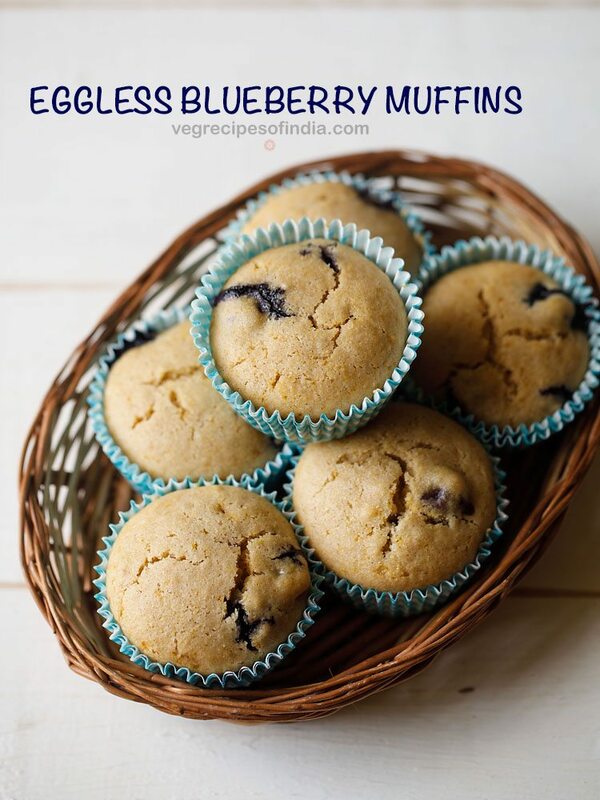 if you are looking for more eggless cakes recipes then do check vanilla cake, chocolate cake, black forest cake, pressure cooker chocolate cake and eggless banana cake recipe. grease a 6x6 inches square pan with softened butter. you can also use a 5 to 6 inches round pan. in a seive, add 1 cup whole wheat flour (120 grams atta) and 1/2 teaspoon baking powder. keep the sieve on top of a mixing bowl or pan. sift both the dry ingredients. also preheat oven at 180 degrees celsius for 20 minutes. 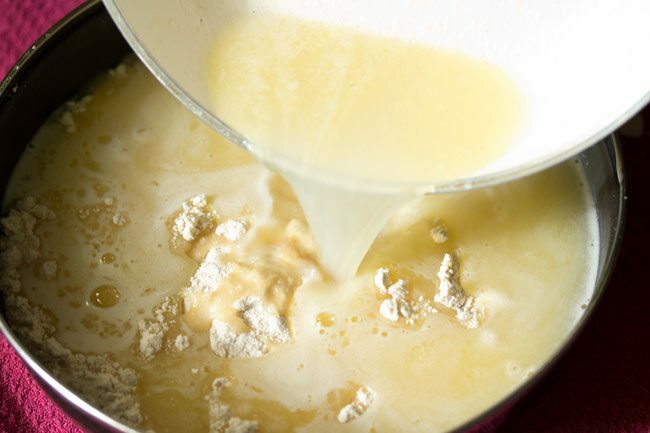 now add 1/2 cup sweetened condensed milk (125 ml or 125 grams). do not mix. just keep aside. in another pan, take 80 grams butter and 1/2 cup water. keep the pan on stove top and on a low flame heat this mixture. the butter will melt initially. do stir occasionally. 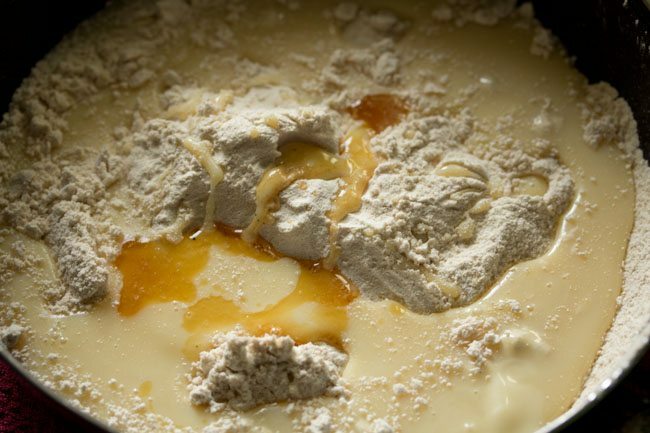 once the mixture comes to a boil, then remove the pan and pour the entire boiling hot mixture in to the flour mixture. with a wired whisk, begin to mix lightly. mix with light pressure, so that over mixing does not happen. 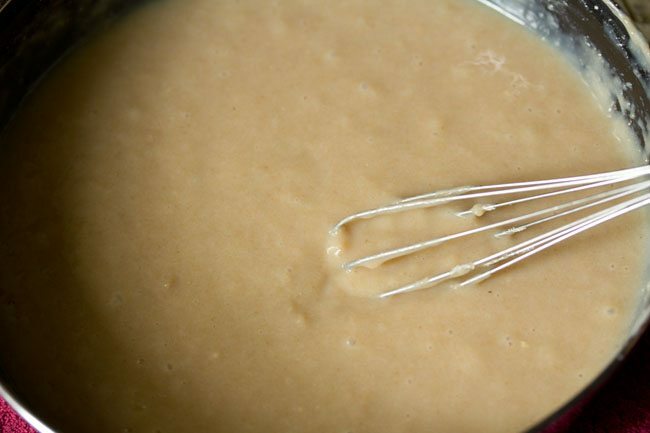 mix to a smooth batter. if there are small tiny lumps, then let it be. do not over mix. 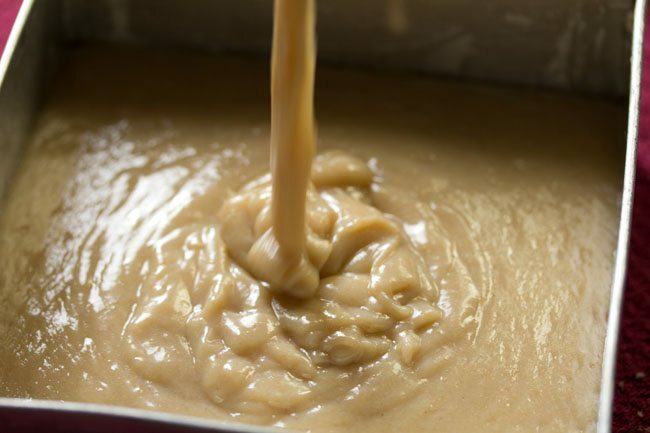 now pour the cake batter in the greased square pan. gently shake the pan or tap the sides. 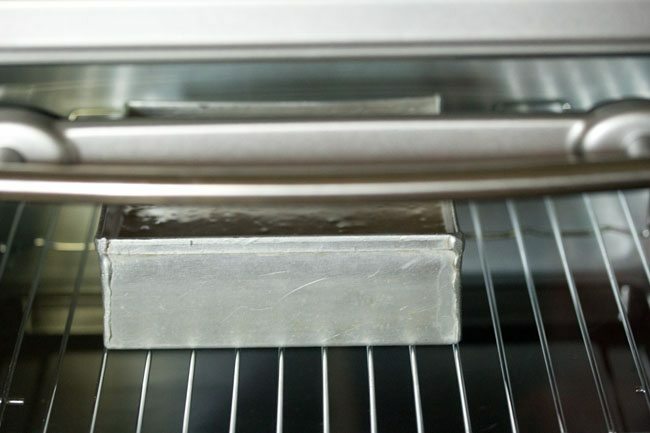 place the pan in a pre heated oven. bake at 180 degrees celsius for 45 minutes to 1 hour. in my oven it took about 1 hour to bake. yes that long. oven temperatures are not same everywhere, so while baking do keep a check. also please do not open the oven door till 3/4th of the cake is done. the top should be golden and when you insert a tooth pick in the atta cake, it should come out clean. let the wheat cake become warm or cool completely, before you serve it. 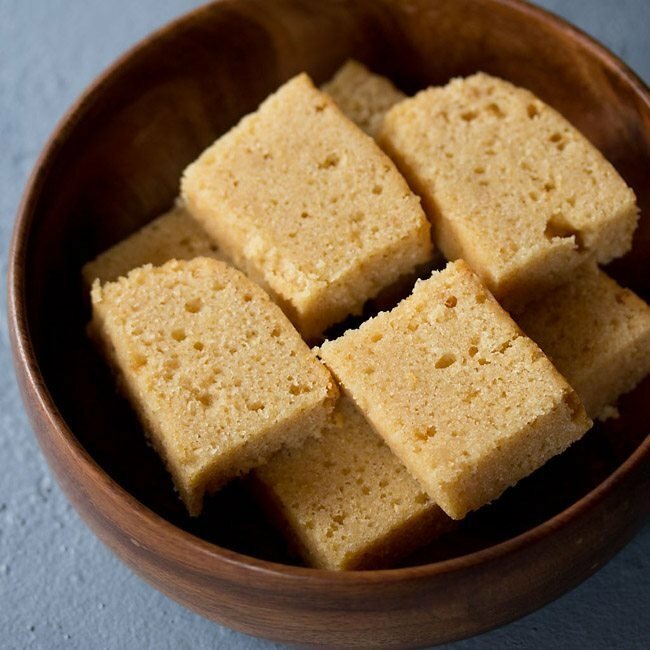 in cooler climates, the wheat cake can be kept at room temperature for 1 to 2 days. do store in a box. in warmer or hotter climates, refrigerate the cake. this whole wheat cake stays good for about a week in the fridge. if you do not have unsalted butter, you can use salted butter too. 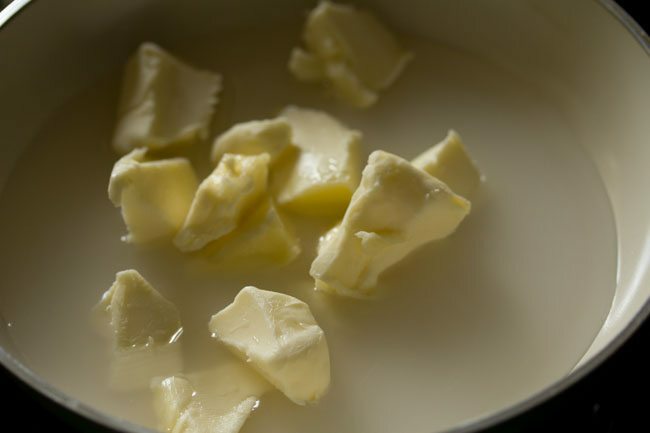 substitute for butter is 1/3 cup oil. can use a neutral flavored oil like sunflower oil or even olive oil can be used. 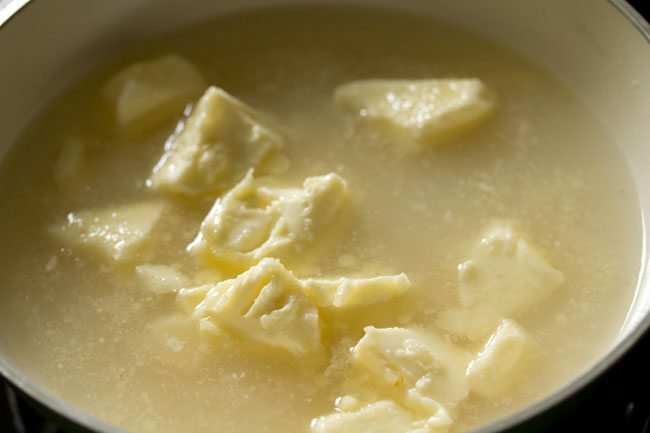 ghee can also be used instead of butter. 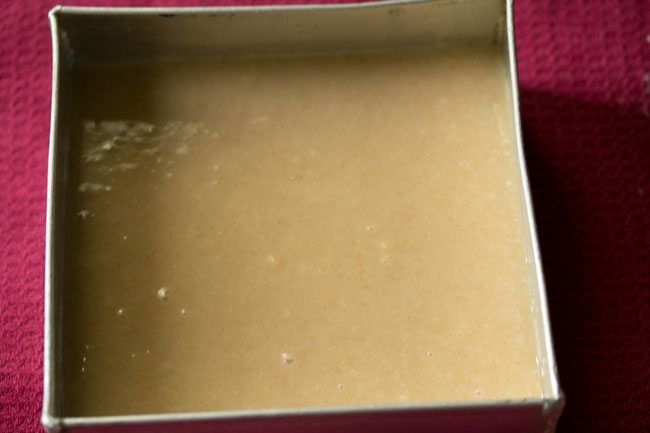 1. grease a 6×6 inches square pan with softened butter. you can also use a 5 to 6 inches round pan. 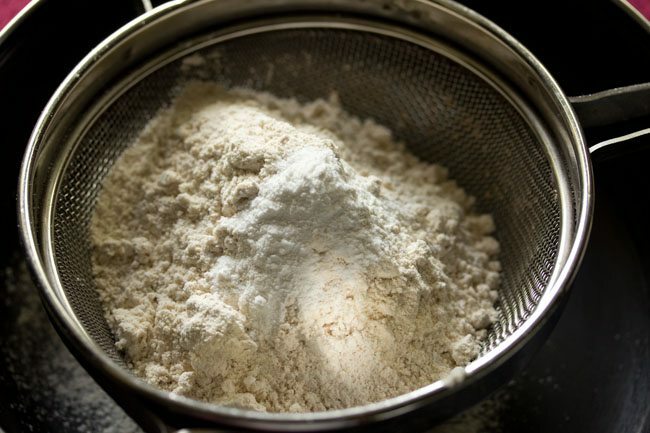 2. in a seive, add 1 cup whole wheat flour (120 grams) and ½ teaspoon baking powder. keep the sieve on top of a mixing bowl or pan. 3. sift both the dry ingredients. also preheat oven at 180 degrees celsius/356 degrees fahrenheit for 20 minutes. 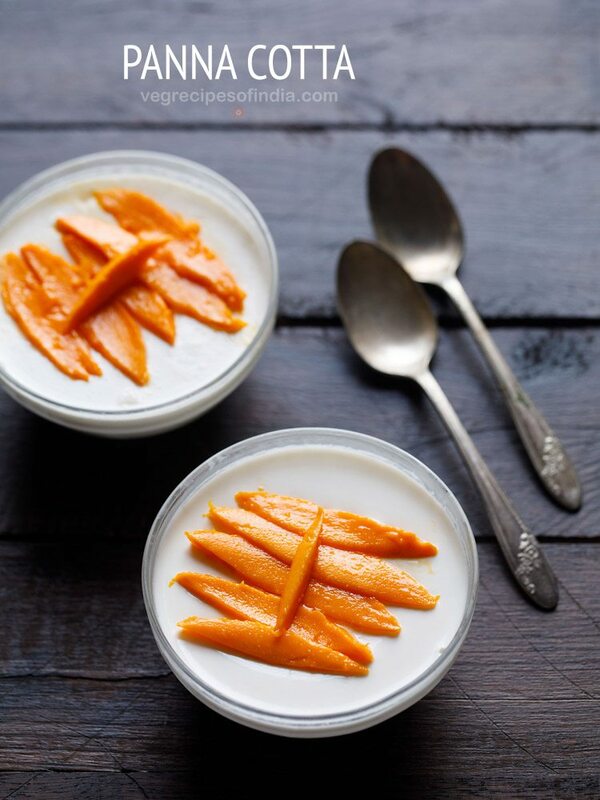 4. now add ½ cup sweetened condensed milk (125 ml or 125 grams). 6. do not mix. just keep aside. 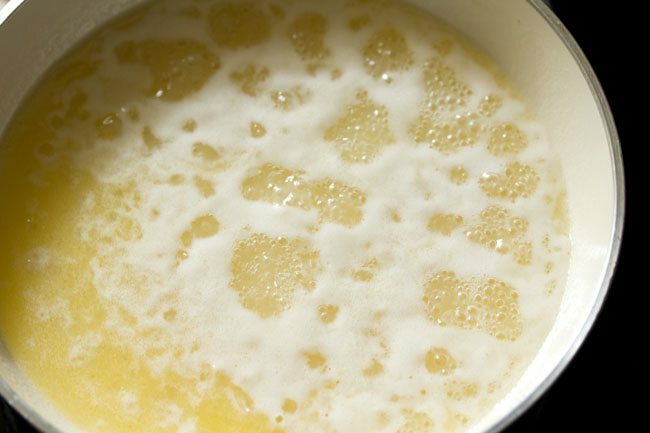 7. in another pan, take 80 grams butter and ½ cup water. 8. add 4 tablespoons sugar. 9. keep the pan on stove top and on a low flame heat this mixture. 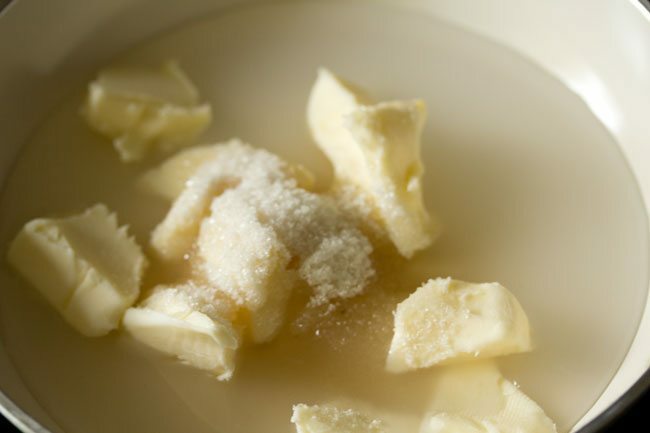 10. the butter will melt initially. do stir occasionally. 11. bring this mixture to a boil. 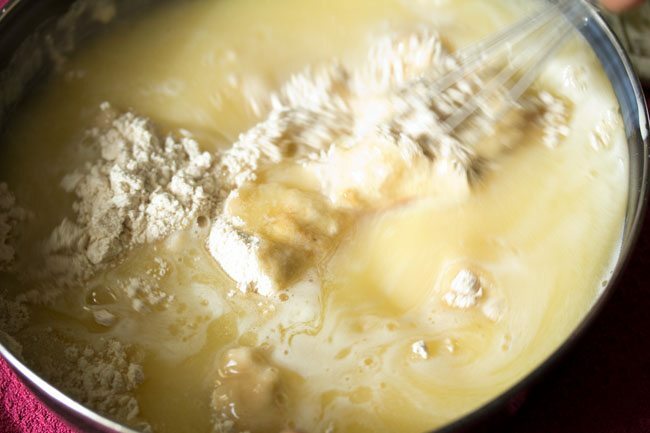 12. once the mixture comes to a boil, then remove the pan and pour the entire boiling hot mixture in to the flour mixture. 13. with a wired whisk, begin to mix lightly. 14. mix with light pressure, so that over mixing does not happen. 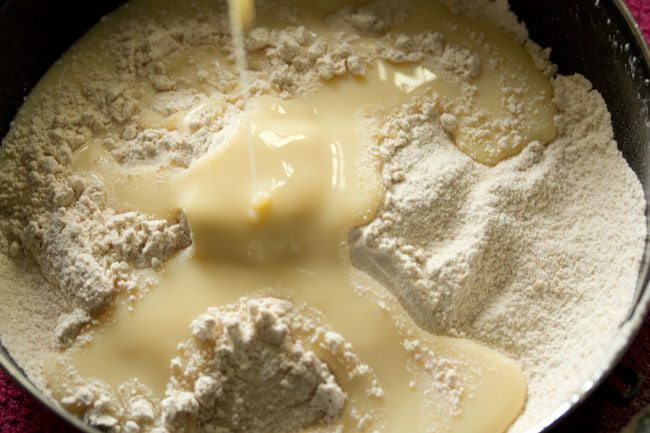 while mixing you will come to know if the batter is going to be thick or too thick. 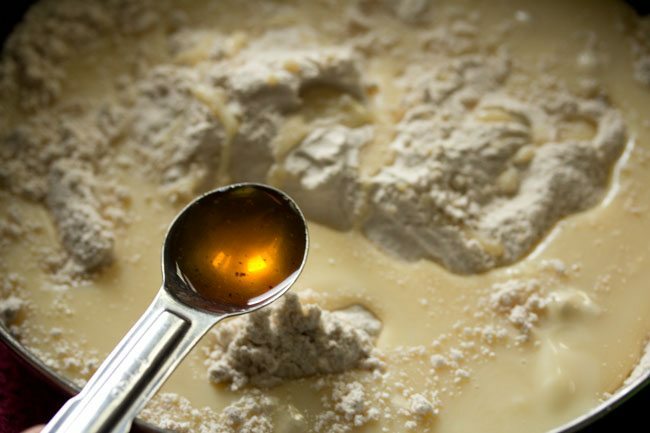 the batter in this recipe is of medium consistency – neither thick nor thin. 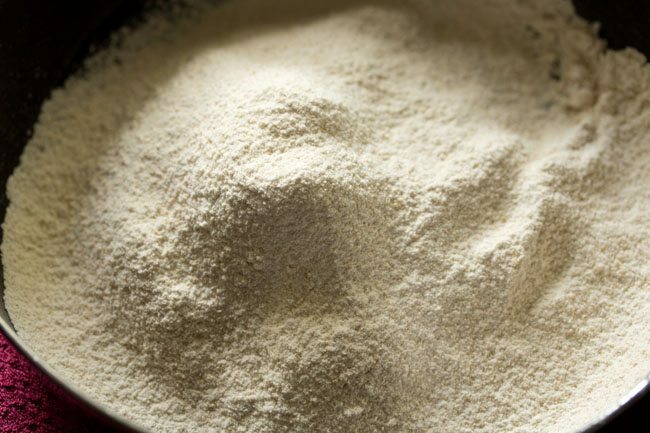 depending on the quality of flour, you may need to add less or more water. 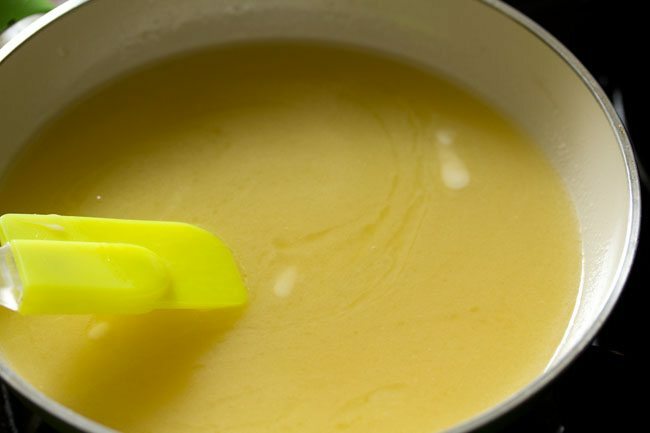 if the batter becomes thick, then do add ¼ to ⅓ cup more hot water. so do keep some hot water handy. 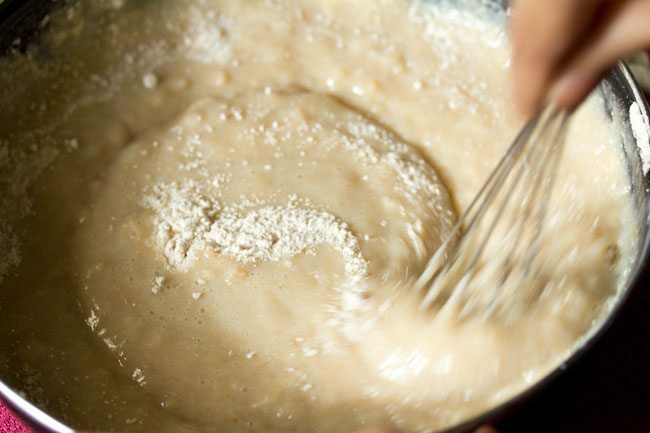 15. mix to a smooth batter. if there are small tiny lumps, then let it be. do not over mix. 16. now pour the batter in the greased square pan. 17. gently shake the pan or tap the sides. 18. place the pan in a pre heated oven. bake the wheat cake at 180 degrees celsius/356 degrees fahrenheit for 45 minutes to 1 hour. in my oven it took about 1 hour to bake. yes that long. oven temperatures are not same everywhere, so while baking do keep a check. also please do not open the oven door till ¾ of the cake is done. 19. here’s the whole wheat cake after baking. the top should be golden and when you insert a tooth pick in the center of the cake, it should come out clean. 20. let the wheat cake become warm or cool completely, before you serve it. 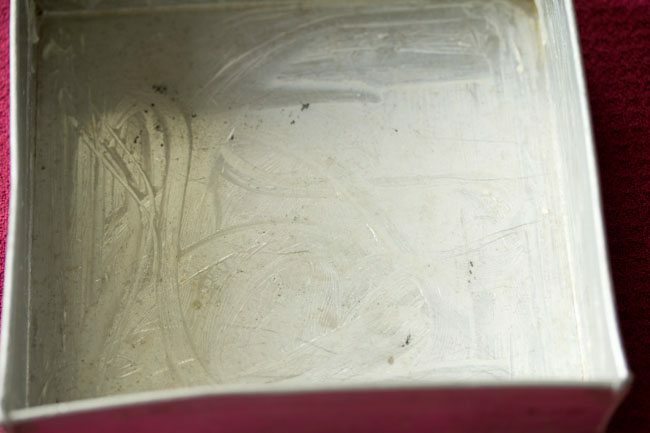 in cooler climates, the cake can be kept at room temperature for 1 to 2 days. do store in a box. in warmer or hotter climates, refrigerate the cake. this wheat cake stays good for about a week in the fridge. Hi can it be cooked in a microwave instead? if yes, then for how long? 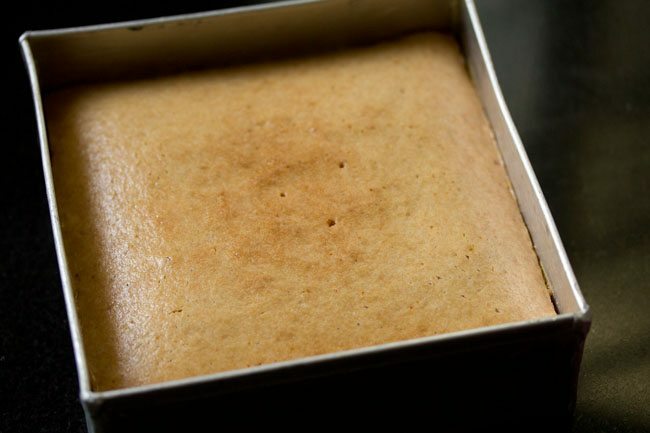 this wheat cake cannot be made in the microwave mode of the oven. if you have convection mode in the microwave oven, then you can make it. deepa i have replied to your comment. refresh the page and you will see your comment as well as my reply. 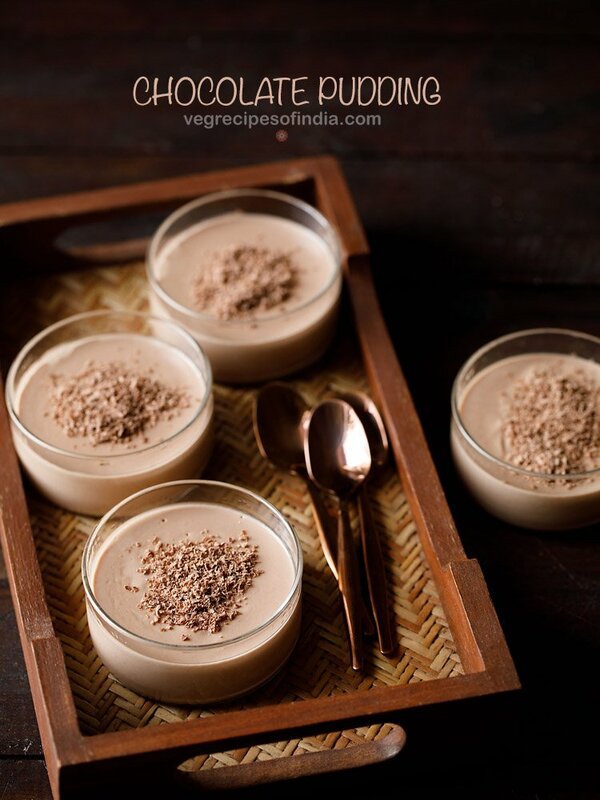 deepa, in this recipe condensed milk is used as a substitute for eggs. so sugar won’t work as a substitute. if using sugar then the recipe has to be changed in regards to the type of ingredients and their proportions. it will need to be tested first. 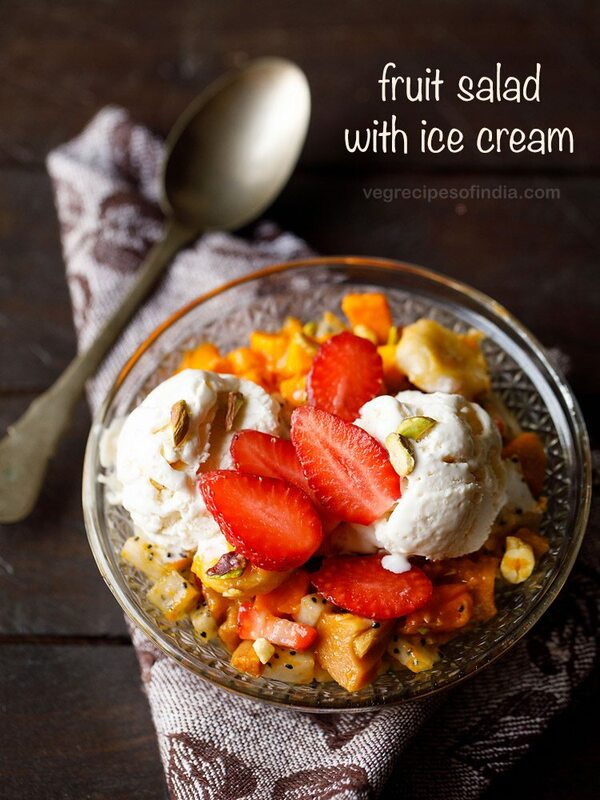 Thank you dasanna for such wonderfully recipe my husband nd 1 year old really loved it thanks. Welcome Richa. Glad to know this. Its very simple to make it in home isn’t it??? 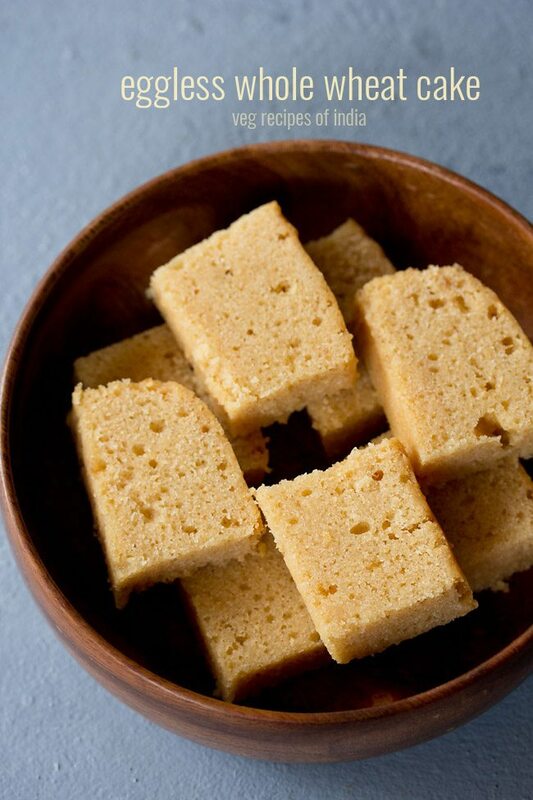 I think it will be yummy to taste…………………………………..
yes suwarana, atta cake is simple and easy to prepare. the taste is also good.